FACT (Foundation for Art and Creative Technology) is the UK’s leading media arts centre, based in Liverpool. 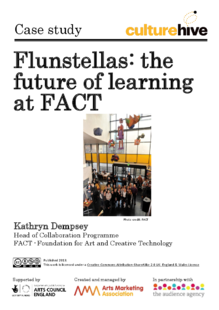 This case study describes how FACTs milestone project ‘Flunstellas’ took digital technology into the classroom and embedded it within curriculum-based learning. Working with Year 7 and 8 students from Weatherhead Media Arts College and emerging artist, Neil Winterburn, Flunstellas explored the future of learning. The end result of this highly collaborative process was Charlie, a large-scale installation in the FACT atrium as part of the Knowledge Lives Everywhere exhibition. Flunstellas was exhibited alongside world-class artists as a significant part of the Knowledge Lives Everywhere exhibition at FACT. The exhibition drew an estimated audience of 38,000. The exhibition also included a screening event for parents at FACT of the documentation and the artwork. All students involved in the project developed their digital skills. Teachers also developed digital skills and grew more confident in using creative technology in their teaching practice. The teacher reported students were more perceptive of one another’s positions in the class after participating in Flunstellas and were more understanding of each other. A stronger more strategic relationship was developed between FACT and the school as a result of the project. The artist’s practice also developed and was supported with engagement in further legacy projects.